Alexander Zaitsev formed one of the greatest partnerships in the history of figure skating with the great Irina Rodnina. Rodnina had won her first Olympic pairs title with Alexei Ulanov in Japan in 1972 with a performance that did more than break the mould, it smashed it to pieces. What happened at Sapporo proved to be a watershed in skating, the moment when the flowing, classical approach of the 1968 winners Lyudmila Belousova and Oleg Protopopov was swept away, in a dance revolution fomented by Rodnina. From that moment the diminutive, brown-haired Irina maintained a vice-like grip on the pairs discipline of figure skating for over a decade. 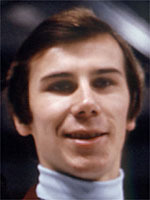 The crunch came when, after winning Olympic gold in 1972 with Ulanov, he announced that he was leaving her to team up with rival skater Lyudmila Smirnova, with whom he had also begun a romantic liason. This hit Rodnina hard, but her disappointment was soon behind her and she began the search for a new partner. The newly formed duo started winning title after title at the European, world and Olympic level. The tiny Rodnina with her dazzling eyes combined perfectly with Zaitsev, a tall, strong and elegant athlete. Perhaps not surprisingly, their sublime talent blossomed at their first competition together, the 1973 European championships in Cologne, and in the free programme they were awarded 12 perfect scores of 6.0.